As a country invaded by the Brits and settled by their convicts, much of Australia’s food traditions are adopted largely from our UK cousins. These days, Australia is a proud multicultural food haven, but at Christmastime, our sunny festive lunch tables often feature a menu of our nanna’s old, hand-written recipes: boozy, fruit-filled pudding, buttery shortbread, cold cuts of roasted ham, and our own berry-topped pavlova (also claimed by our NZ friends, depending who you ask). On our recent trip to Oz, Leigh and I celebrated an early Christmas in our hometown, Adelaide. South Australia gets a bad rap from the rest of the country, with our Eastern neighbours dismissing SA as a snoozy state with not a whole lot to offer. They’re wrong. This year, not only did Elon Musk gift us the biggest battery in the world, but Gourmet Traveller magazine named Rundle Street restaurant Orana the best in the country; historic McLaren Vale winery d’Arenberg opened its $14 million new wine-tasting and dining complex; and Lonely Planet named SA the fifth best region in the world to travel in 2017. Global fame aside, there are still plenty of hidden South Australian secrets that only locals know about. And one of them is Perryman’s Pies. This 168-year-old corner-shop bakery in North Adelaide is busy at the best of times, but at Christmas, queues curl out the door for the famous Perryman’s handmade fruit mince pies, another Australian festive tradition from our British heritage. “The bakery first opened in 1850, and that was built and run by the baker [Diedrich Mahnke]. 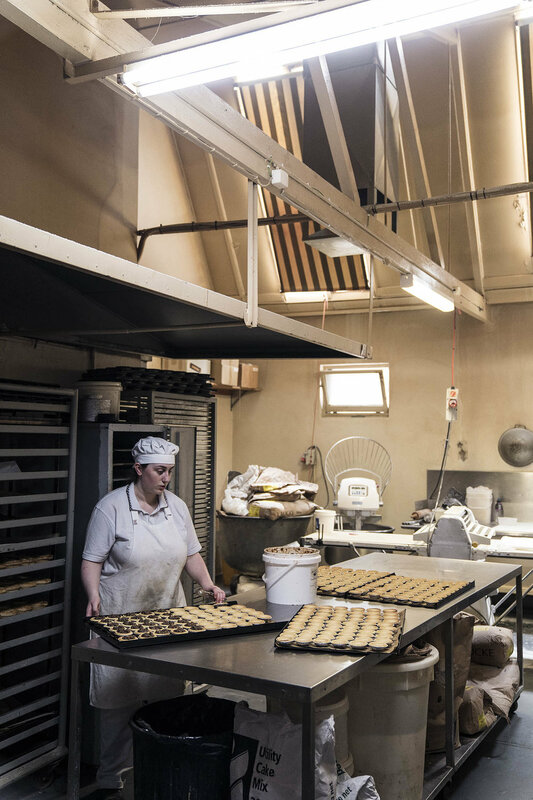 In 1925, the Perryman family bought the business,” says Kylie Schmidt, who bought the business from third-generation owner and baker Neil Perryman in 2011, along with her business partner Conor McGuinness. “A lot of what we bake is from the Perryman's original recipe book.” Kylie pulls out a thick old notebook, filled with hand-written recipes and baking notes from Neil’s mother. Like many South Australian settlers, the Perrymans had a German background, and their recipe book is filled with traditional treats like streusel, apple buns and gingerbread. “Neil knew all the recipes by heart he'd been in it for so long, so when we bought it he gave us this recipe book to use. We had to convert all the recipes from pounds and ounces into grams.” Australia adopted the metric system in the 1970s, making the cookbook at least 50 years old. Spiced 'mincemeat' pies originated in the UK in the 12th Century, after the Crusaders brought them to England from the Middle East. Back then they were more true to their name, traditionally filled with mutton, beef or rabbit mixed with cinnamon and nutmeg. By the 19th Century, and with the publication of iconic cookbook Mrs Beeton’s Book of Household Management, mincemeat pies had added sweet dried fruit (raisins, currants and citrus peel) and left only a little minced beef to the mix. These days, suet, or beef fat, is the only meaty addition to the fruit filling, stirred in to enrich the flavor and keep the pies juicy. Aside from using vegetable shortening instead of suet, the bakers at Perryman’s follow a traditional fruit mince pie recipe very close to what Neil’s grandfather wrote more than 90 years ago. “We soak the fruit in rum and brandy for three months, so it gets quite boozy,” says Kylie. Her partner and Perryman's co-owner, Rosalie Dow-Schmidt adds, “Like sourdough has a starter, we do the same thing with our fruit mince filling. We keep a little of the previous year’s filling to starts the next year’s recipe off. It adds a bit more depth,” she says. As well as the traditional recipe, the Perryman brand is so popular simply because it’s been such a household name in customer’s family for generations. “People want to come here because their grandfather came here as a little kid. The school next door, North Adelaide Primary, that has so much history, and there's a big connection between them and us,” says Kylie. “Almost everyday someone will come in and say, ‘I've been coming here every week for 40 years and nothing's changed,’” adds Rosalie. 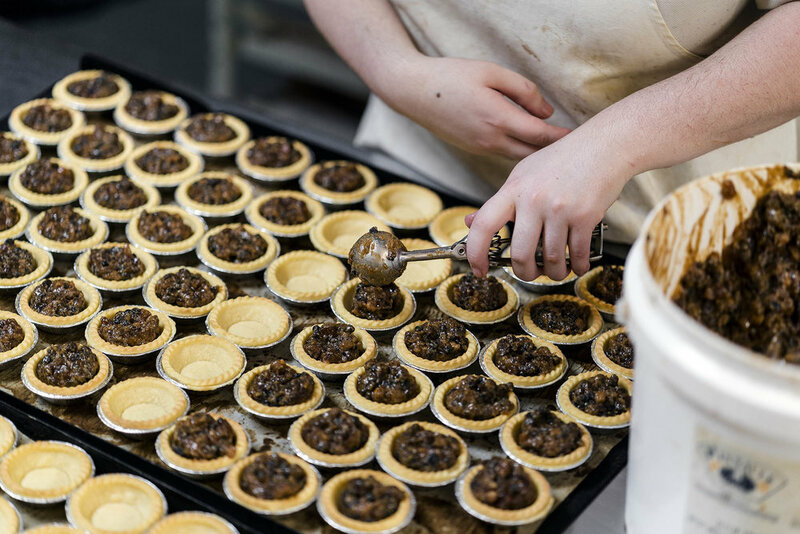 One of Perryman’s bakers, Glenn, puts the finishing touch – a sprinkle of sugar – on a batch of mince pies before sliding the tray into the bakery’s towering 60-year-old German oven. “People appreciate knowing our products are handmade,” says Kylie. “You get variety in the end product, but that’s what home-style baking is."